It's the middle of August and despite the fact that summer is winding down, it's still hot out. So why not test the heat with a cool and refreshing....pie. 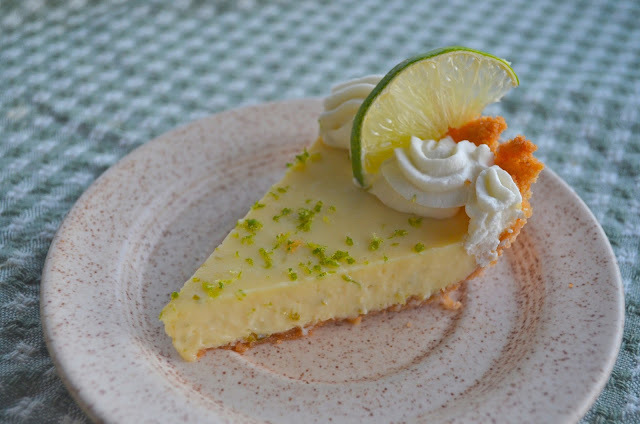 Not lemonade (although I guess you could drink lemonade while eating a slice of pie), but yes, Key Lime Pie. Technically speaking, I made "Persian" lime pie. Persian limes are the larger green limes you commonly find in the grocery store. They are grown in Mexico, opposed to the ping pong sized greenish-yellow key limes grown in Florida. What is the difference? The truth is that not many people can tell the difference between persian and key limes. With some research, I found that key limes have a lower yield of juice and zest, a slightly higher acidity, and a bit more of a powerful aroma. Not to mention that in my grocery store, key limes were more on the pricey side than persian limes. Considering that I needed 1/2 cup of lime juice and persian limes would give me about 3 tbsp. per lime opposed to key limes with a yield of 3 tsp. per lime, I sacrificed the "powerful aroma" to meet my budget. Regardless, the pie still tasted fantastic and got raving reviews, so I guess my choice of limes was good after all. 2. Combine all of the ingredients for the crust in a food processor and pulse until the crumbs are moistened enough to press together, but not wet. Add more melted butter if needed. Press into a 9" pie tin and bake until browned, about 7 minutes. 3. Meanwhile, whisk together the yolks, sweetened condensed milk, cold heavy cream, vanilla, and lime zest. Slowly, in a steady stream, whisk in the lime juice until the mixture thickens and forms a custard. 4. Lower the oven to 325 degrees. Pour the custard filling into the crust and return to the oven no more than 15 minutes. 5. Let cool from the oven, cover, and refrigerate the pie overnight. 6. To make the whipped cream topping, use an electric whisk attachment, whip the cold cream, vanilla, and sugar to a medium peak. Insert the cream into a piping bag with a #3 star tip. 7. Garnish the pie with whipped cream and lime zest. *serve on a nice summer day, pie may be refrigerated for 3 days.